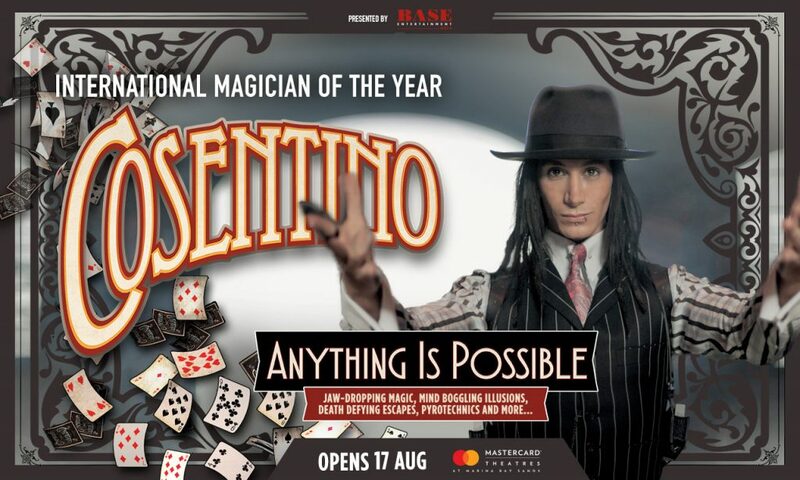 Consentino is the latest illusionist to hit the shores of Singapore. Awarded the International Magician of the year, this grand illusionist promises to be a hit with the family. We were therefore looking very much to watch this Master Magician for ourselves! Playing for 8 shows all the way to the 27 August, Magicians have come a long way from their simple card tricks. These days, it is not just the sleight of the hand, but they need to entertain and draw the audience into the whole act. We did not know what to expect as we made our way to the theatre, but we could just feel that we were in for a great time. For those unfamiliar with Consentino, he shot to television fame for coming in 2nd for Australia’s Got Talent in 2011. Since that appearance, he has taken his show on a tour and this is his first time performing in Singapore. His act hinges on the same old-meets-new fusion of straitjacket escapes, card-sharping, spoon-bending and water-tank immersions juiced with pyrotechnics and rock-star choreography. Reading such compliments paid to the man, I was definitely interested to catch the act for myself. Touted to Make Anything Possible, Constentino has a barrel of tricks that makes you keep on wondering, “How did he do it?! ?” In fact, once the kids warmed up to the Marina Bay Sands theatre, they had lots of Ooos and Ahhhhs to punctuate the show, as they watched the master Magician at work. When it comes to the card tricks, Constentino proved to be a master with his sleight of hand. I enjoyed the good old fashioned tricks where there was a levitation and a walking through the door acts. The Escape acts were a big highlight, although the water trap act was slightly anti-climatic as the television advertisement promised more – namely the size of the water tank. However, Consentino does prove his “salt” and the whole family had a great night out together. If you are thinking of catching the show, Consentino will be playing at the Marina Bay Sands theatre all the way to the 27 August. Discounts are available for students, NSF and Seniors as tickets are sold at $35 only! (Many thanks for Base Entertainment for the invite). Tickets can be purchased at Marina Bay Sands here.